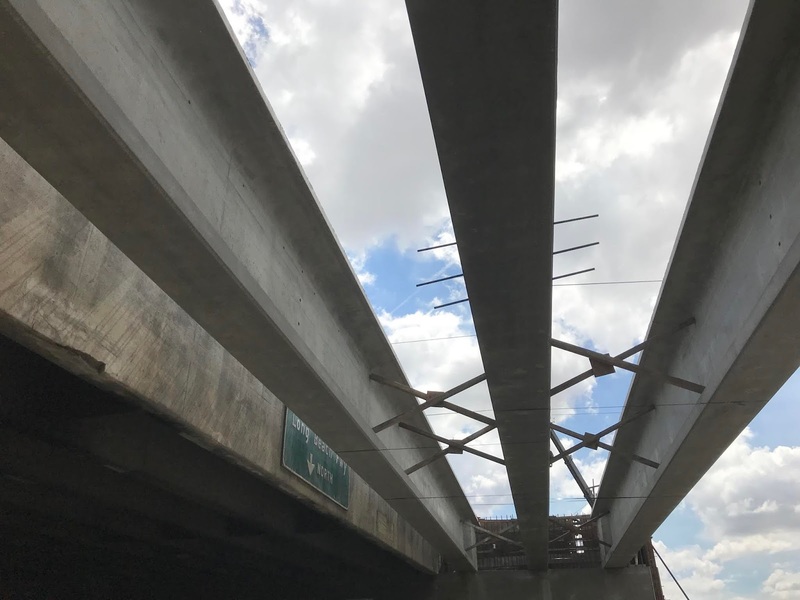 If you’ve taken a drive on Interstate 710 (I-710) through Vernon and Commerce recently, you might have noticed the brigade of cranes, pile drivers, and heavy-duty construction equipment near the side of the highway. You also might be wondering what it is exactly that crews are working on. 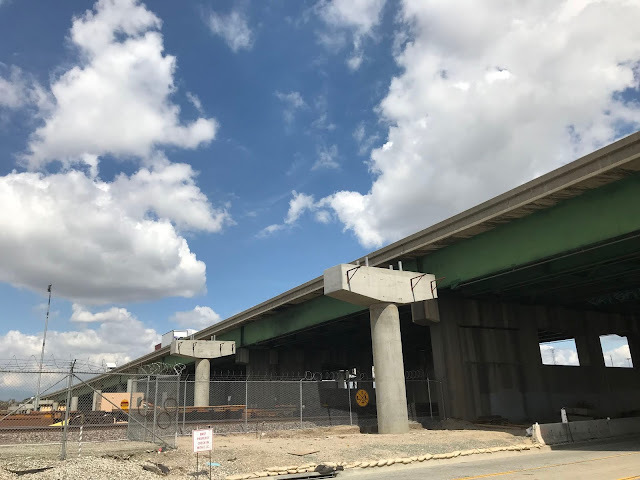 Caltrans is almost a year into a $150.7 million pavement rehabilitation and bridge widening project on I-710 between Slauson Ave in Bell and State Route 60 (SR-60) in East Los Angeles. 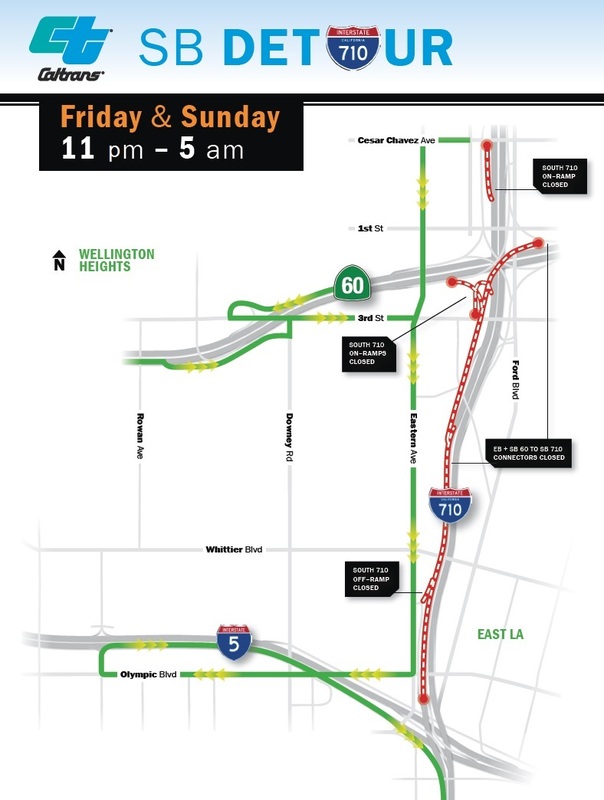 Beginning on the weekend of April 26, 2019, crews will begin overnight full closures of southbound I-710 between SR-60 and Interstate 5 (I-5) from 11 p.m. to 5 a.m. on Friday and Sunday nights. On Saturday and Sunday, crews will have extended DAYTIME closures that will restrict traffic to two lanes on the same segment where the full closure occurred. The extended weekend closures are necessary for workers to arrange k-rail on travel lanes and work safely behind the barrier to begin repaving lanes on the highway. Crews will begin closing a segment of I-710 every two weekends, starting on April 26. Work will NOT be conducted on holiday weekends or when rain is in the forecast. Motorists should expect delays during the full and extended closures and are strongly advised to plan ahead, use alternate routes or public transportation, or avoid the area. Additionally, motorists can check traffic conditions before they leave by visiting the Caltrans Quickmap. The I-710 pavement rehabilitation and bridge widening project consists of rehabilitating 37 lane miles on I-710 with Joint Plain Concrete Pavement (JPCP) and widening the BNSF Hobart Yard bridge to accommodate standard lanes and shoulders. In addition, the median shoulders will also be repaved with JPCP and the median barrier will be upgraded to meet current standards. New drainage, sign structures, traffic loops and fiber-optic cables will be installed to communicate real-time traffic information to our Traffic Management Center. Most of the work that has been performed has been out of the motorists sight and is located inside the BNSF Hobart rail yard. Workers have already began to place girders, support columns, and abutment walls at Washington Blvd, Shelia St, and inside the BNSF Hobart rail yard to begin widening the bridge. Girders are placed above Washington Blvd in Commerce where the new shoulder on I-710 will be constructed. 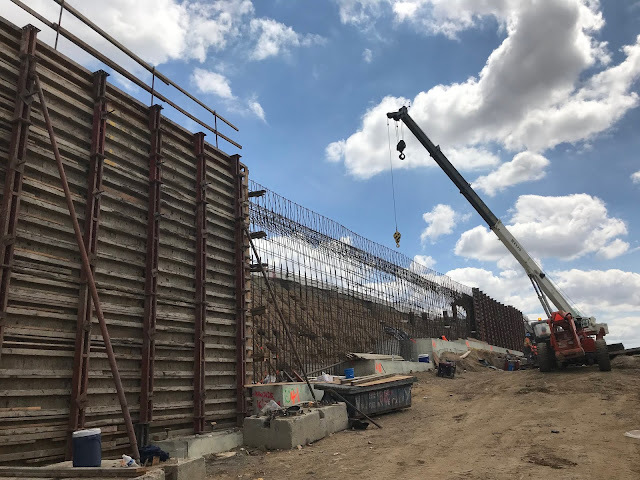 A retaining wall, wing wall, and abutment wall are being constructed on southbound I-710 just south of Washington Blvd. Support columns are being constructed on northbound I-710 at Sheila St. and inside the BNSF Hobart Yard in Commerce. 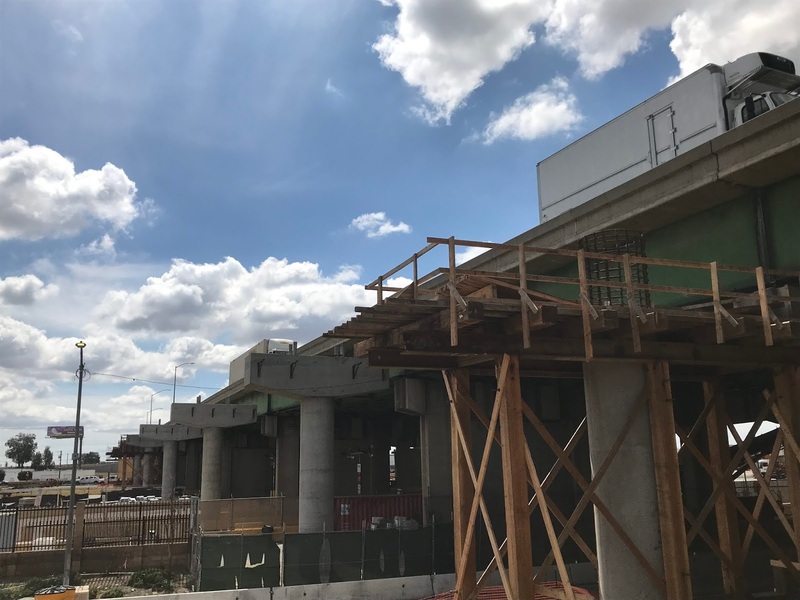 Support columns constructed on southbound I-710 near 26th Street and inside the BNSF Hobart Yard in Vernon. 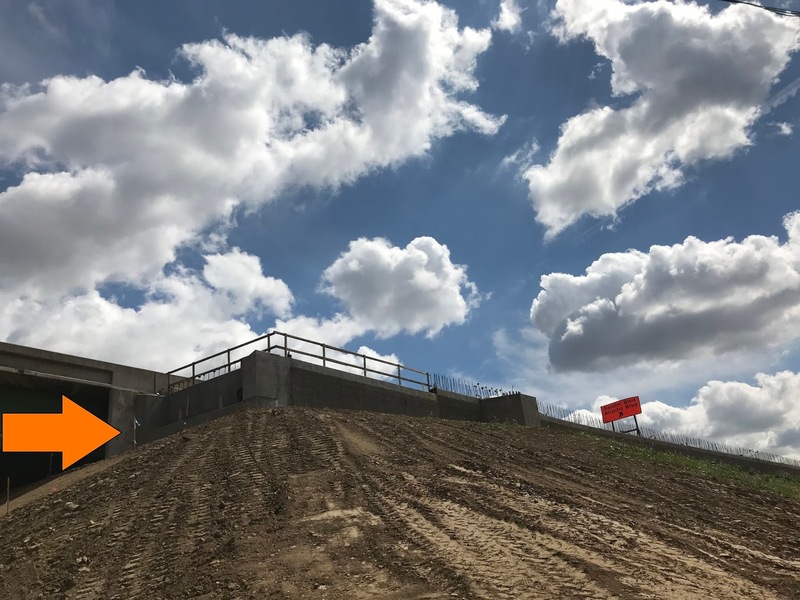 Arrow is pointing to new shoulder that has been constructed on southbound I-710 at 26th St.
Crews are placing a steel column inside the BNSF rail yard. Caltrans reminds drivers to be "Work Zone Alert" and to "Slow for the Cone Zone." Why is State Route 2 Still Closed Near Mt. Wilson? Ask Caltrans: Can I complete court-ordered community service with Caltrans? ™Caltrans District 7 2012. Powered by Blogger.